It is estimated that the final turnout is above 50 per cent. THE POLLS HAVE now officially closed in the local and European elections. Early in the day, turnout was reported at 10 per cent. 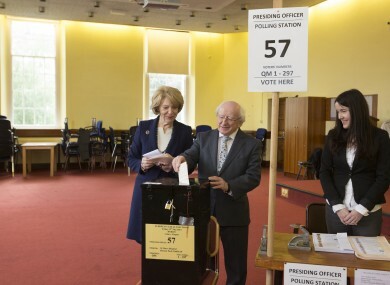 It rose to 30 per cent, and RTÉ is now reporting that turnout was “somewhere above 50 per cent”. People cast their votes for their favourites of the 2000 candidates running for 949 local authority seats, and 41 people running for 11 MEP seats in the European Parliament. Polling stations remained open until 10pm tonight. The day sadly saw some tragedy with the death of Monaghan councillor Owen Bannigan, who was running in the Ballybay-Clones local elections. He died suddenly while he was canvassing today. All votes cast in the Castleblayney area will be destroyed and another date will be set for a recasting of ballots. We’ll be liveblogging and covering all of the action from tomorrow and across the weekend as the election counts get underway. Email “Voting over: All polls closed in local and European elections”. Feedback on “Voting over: All polls closed in local and European elections”.